BMW has released the M3 E46 video for performance enthusiasts. You may even entertain the thought of buying one. 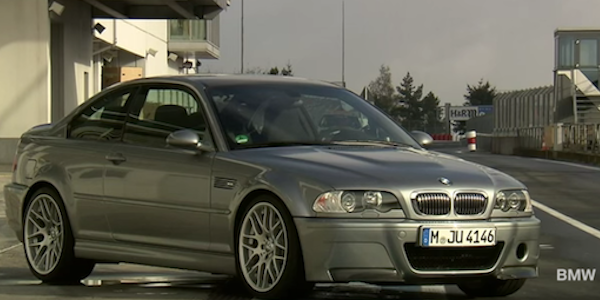 Watching BMW’s M3 E46 video could make you want one because they are a blast from the past. We’ll start out the new year by going back in time and look at the most successful model in M3 history. BMW has produced another informative M3 video, the next in their series for performance enthusiasts. It might just make you entertain the thought of getting a used E46 of your own in 2016, which may not be such a bad idea. Remember the M3 E46 CSL? One look at the M3 E46 would give M3 fans a few reasons to want to own one. BMW M produced the E46 from 2000 to 2006 and they sold around 85,000 examples to performance fans around the globe. There’s lots of good well-kept examples out there for sale right now. It was the first M3 to get the unique side air vents that originally had purpose, but find out from the video, they really weren’t necessary. They became a distinguishing mark on all M3 models because executives wanted to keep them. The M3 E46 came with an all-new 3.2-liter naturally aspirated inline six-cylinder engine that shared just three parts with its predecessor, the oil pan gasket, the V-belt tensioner and the rear crankshaft cover plate. The high-revving 3.2 liter engine produced 343PS (338hp) and 365Nm (269 lb-ft) of torque in the European version, and 338PS (333hp) and 355Nm (262 lb-ft) of torque in U.S. variants. BMW M engineers concentrated on light weight and high revs (8000 rpm) when developing the E46. The E46 was the M3 that solidified the series as the performance icon it is today, especially in the limited production M3 CSL trim (Coupe Sport Lightweight) with the code name SA Sport. That stood for special equipment which meant it was for purists who wanted more performance from the M3 E46. BMW used more aluminum, fiberglass, thermoplastic and carbon fiber to reduce weight. It was the first M3 to get a carbon fiber roof. Being 110 kg lighter than the standard M3 model, made it quick around the Nurburgring at 7:50. Will the M3 E46 be a good investment? The BMW M3 E46 was offered as a coupe or a convertible. It was the first M3 to come with unique side air vents, it was powered by the all-new 3.2-liter engine and it was lighter and faster than the previous generation. The BMW M3 E46 could be a good “investment” because these cars are an affordable blast from the past. Don’t get one because you are hedging your bets and think it will go up in value, buy one because it will bring you enjoyment when you get behind the wheel, it will bring some stress relief at the end of the day, it’s a blast to drive in the curves and it could keep you from seeing a therapist. You may want to entertain the thought of getting an E46 of your own in 2016. Watch the video on the BMW M3 E46 below.